Bearing in mind the obvious—that things that no longer exist are difficult to find—I set out to find, stroll across, or at least look at what was left of the storied Ponte della Maddalena (the Magdalene Bridge) in Naples. Indeed, one reads of the Battle of the Magdalene Bridge and the Miracle of the Magdalene Bridge; there are paintings entitled Looking Back at Naples from the Magdalene Bridge and Vesuvius Erupting, Seen from the Magdalene Bridge (painting above, by Pierre-Jacques Volaire, done in the late 1700s) and there is even this delightful porcelain plate (image, left) in the collection of the Capodimonte museum that shows a “Chinese casino” that once existed at the Magdalene bridge. Alas—there is no longer a Magdalene Bridge. 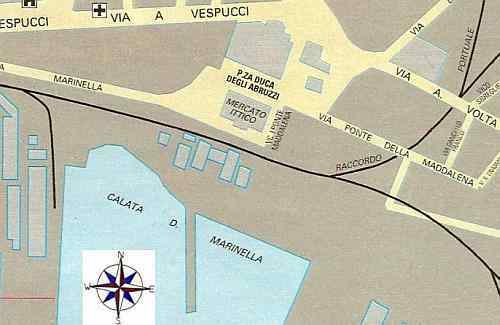 I did find, however, the street that used to be the bridge; it is via Ponte della Maddalena, in an area that most people now think of as “down at the industrial port”; it is clearly marked on the right side of the map below, leading south-east from Piazza Duca degli Abruzzi (in the center). Old maps indicate the area east of the Carmine (today’s Piazza Mercato, off this map to the left) to be where the Sebeto river emptied into the sea. The first bridge of any note over the river at that point is said to have been the Pons Padulis bridge, also known as the Guizzardo bridge, built by Robert Guiscard, Duke of Puglia, when he lay siege to the city in 1078. The bridge was rebuilt in 1528 and acquired the name of a nearby chapel dedicated to Mary Magdalene. The bridge was rebuilt again in 1747 under Charles III and once again in the second half of the 19th century. At that point, the growth of modern industry and changing hydrological conditions caused the river to dry up and the bridge to lose its purpose. The position of the bridge also made it a logical route into the city by an invading force and thus the obvious place for defenders to make a last stand before retreating within the city walls. 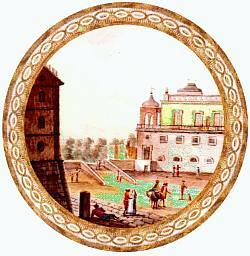 As indicated above, there were battles at the Magdalene Bridge; the most famous of these was the last stand of the forces of the short-lived Neapolitan Republic in 1799 against the returning royalist Bourbon army that eventually retook Naples from the revolutionaries. 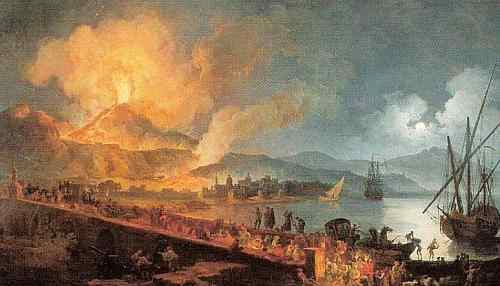 The “miracle” of the Magdalene bridge refers to the purported miraculous cessation of the powerful eruption of Vesuvius in December of 1631, a miracle wrought by the intervention of San Gennaro, the patron saint of the city. At the time, the cardinal of Naples led a procession towards the bridge to invoke the intercession of the saint. 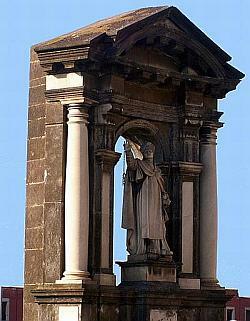 A shrine was put in place after the 1777 eruption (photo, left); it still stands and shows the saint looking towards Vesuvius, his right arm outstretched as if to stay the force of the volcano. Recent restoration has revealed at least some of the original configuration (from the 1528 rebuilding) of the Magdalene bridge: there were five arches with the central one being the largest. There were two shrines at the bridge; one is of San Gennaro (mentioned above), the other is of St. John of Nepomuk, the traditional protector against floods and the protector of the bridge, itself. If the painting at the top of this entry is reasonably accurate as to scale, the Nepomuk shrine is at the center of the bridge (the S. Gennaro shrine, directly across from it today, is not yet in place). The bridge at that time looks to have been about 70 meters long, much shorter than the street that bears the name of Via Ponte della Maddalena today. It is almost impossible to visualize the area of the old Magdalene Bridge as it must have looked 200 years ago. The city wall no longer exists; the river is dried up; the bridge, itself, has become a street, and the entire area is now built out into the sea (on landfill) as the industrial port of Naples, which was heavily bombed in WWII.